File this one under K for Karma. US coal power plants have spent the past few decades messing with the nation’s water resources, and now water is turning around and messing with coal. 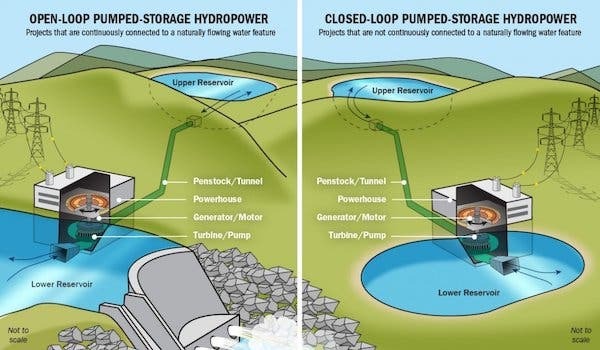 The Energy Department is pushing ahead with plans for new hydropower and pumped hydro initiatives that will provide more energy storage and knock coal out of the baseload power generation picture. Let’s focus on pumped hydro first, because that’s where the DOE is looking to upend conventional wisdom. Pumped hydro is an old technology but it still plays an outsized role in energy storage globally and here in the US. The basic idea is to store energy in the form of water held in an uphill reservoir, and leverage gravity to send it downhill to a generating station. These giant “water batteries” still account for more than 95% of energy storage capacity in the US, so there’s that. According to the conventional wisdom, the problem is that suitable sites for new pumped hydro energy storage facilities are limited. Cost is another inhibiting factor, as is the long timeline for project development. The conventional wisdom seems to be fading out. Researchers in Australia just published a new study indicating that the global potential for water batteries is far greater than previously though. The new Energy Department funding also looks to expand the universe of pumped hydro locations. Part of the funds go to the University of Utah in Salt Lake City. Researchers there will focus on existing water storage tanks, of which there are many dotting the US landscape. The idea would be to construct additional tanks at higher elevations. The innovative technology can operate at higher temperature than traditional PSH, achieve 95% mechanical efficiency (each way), and has the potential to reduce capital expenditures and energy storage solutions in relatively flat areas where conventional PSH may not be possible. By using models and datasets to examine different PSH technologies and configurations—such as traditional site-specific design, modularized application, variable speed, separate pump and turbine, etc.—and battery discharge rates to better understand which technologies and storage durations may provide the most value. On top of all this activity, the Energy Department just launched its first ever pumped hydro innovation challenge, aimed squarely at reducing “time, cost, and risk” involved in commissioning new water battery projects. None of this is good news for US coal stakeholders. Despite President* Trump’s repeated promises to bring back coal mining jobs, the Energy Department seems to have ideas of its own. If you caught that thing about flexibility and reliability, that’s code for replacing coal power plants. The Energy Department’s plans for the sparkling green grid of the future focus on integrating more wind and solar, along with smart grid management and energy storage. Building new coal power plants is not part of the picture. The agency is still forging ahead with funding for “cleaner” coal technology, but now the problem is getting investors on board. That’s not likely to happen in today’s environment, at least not in the US. Against the backdrop of falling costs for both energy storage and renewable energy, the hidden cost of coal power is not so hidden any more. In the latest development, our friends over at The Associated Press report that North Carolina’s Duke Energy is in trouble — again — over water pollution issues related to coal ash from power plants. The coal ash problem is another financial prick in the “clean coal” balloon. As reported by AP, North Carolina environmental officials have ordered Duke to excavate all the ash from 14 current and former coal power plant sites. The order will double Duke’s costs compared to the cheaper alternative, which involves covering the open sites. Duke estimates the total bill at $10 billion spread out over 30 years. Duke is not the only energy company dealing with the nexus of coal ash and water pollution. A raft of other coal power plant stakeholders are facing deadlines for fixing their coal ash problem, too. Image: US Department of Energy.